BAR Linkud is a cozy, welcoming bar in which you can experience true Japanese-style bartending and service. There is no cover charge. Foreigners are welcome. As the owner of the bar, I pride myself in my ability to speak a little English - more than you will typically find at other traditional bars - but I am always happy to continue learning! At BAR Linkud, you can drink whiskey, beer, and cocktails. Our Moscow Mule is especially popular. We love music at BAR Linkud, especially Rock, and typically project music videos from the 70's to 90's onto a large screen for all to enjoy. 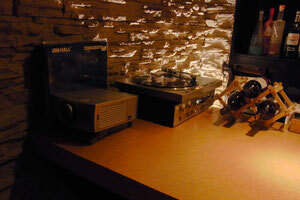 We also have some analogue records (LPs), which we occasionally play but are always happy to play upon request. Those interested in artwork and craftsmanship will appreciate the handmade coasters and other items found in the bar. We look forward to seeing you.